I had been praying for over a year now that when it was time for Dad to say Good-bye I would be able to stop fighting for him and let him go. I’m a fighter you know, I have always been that way, I’m convinced God made me that way. I wanted to be ready to let Dad go so I would not bring him undue pain and fight a fight that wasn’t mine. I knew he would not live forever but I never expected that I would be saying goodbye now. I knew he was sick, but I never dreamed June 25, 2018, would be the day I would say goodbye to my Daddy. Dad had surgery for a blood clot on May 20th. He did surprisingly well with the surgery and started on the bumpy road to recovery. We had to place him in a rehab facility to get his strength and mobility back but the day he was released to go home he seemed to be improving. Since he couldn’t safely navigate the stairs in his raised ranch home we did a quick update of the basement and moved him in. He seemed to know he was home and relax into the new routine. It did my heart good to see him home. He continued therapy and was in good spirits, but his recovery soon started to slow down. The wound on his leg wasn’t healing and he didn’t seem to want to eat much. I continued to pray for wisdom and strength to care for him at home with my sister and our caregiver team. It was a much bigger job than I expected. I was exhausted emotionally and physically from the long days. I continued to spend time with the Lord, asking for wisdom and grace. There was a lot of stress and I can’t say I handled every moment of every day well, but God is Good and provided all I needed. Thursday morning, I awoke early and went to Dad’s bedside as I had the 5 mornings before, but this day Dad seemed different. He was in less pain, he was more affectionate, and he seemed to radiate peace. He wasn’t interested in eating, he just wanted to hold my hand. I sat with him and I prayed silently as I had each morning, praying for Dad’s healing, for my heart and for me to love all those around me well. As I talked with the Lord about Dad’s healing that morning He reminded me of my prayer throughout the last year to know when the right time was to stop fighting and to gracefully let him go. He went on to whisper to my heart it was time, it was time to make the shift. I said really, Lord? He said yes. I said really? He said yes. Help me do that Lord, I’m not ready. But as I looked at Dad I knew he was. Later that day for the first time the home health nurse told us Dad was dying. His body was tired, and he was not going to pull through. It was difficult to hear but I already knew it in my heart, the Lord had prepared me. I will not say that the next 3 days were easy nor was watching my Dad pass away an easy experience but what I can say is that our God is Good and faithful! On one of the most difficult days of my life, I felt loved, cherished and strengthened by the Lord. I’m so thankful for all the days I had to share with my dad. I’m thankful for the relationship with my Lord that allowed the struggles of caring for Dad to be more than just struggles but also opportunities to grow in my relationship with Him, with Dad, my sister and the many caregivers who touched our lives. This month has been a difficult one. I am just starting the transition of life without my Daddy. I am so thankful that I have experienced the truth of Isaiah 41:10 and I will continue to calm the truth of His promise in the days to come. 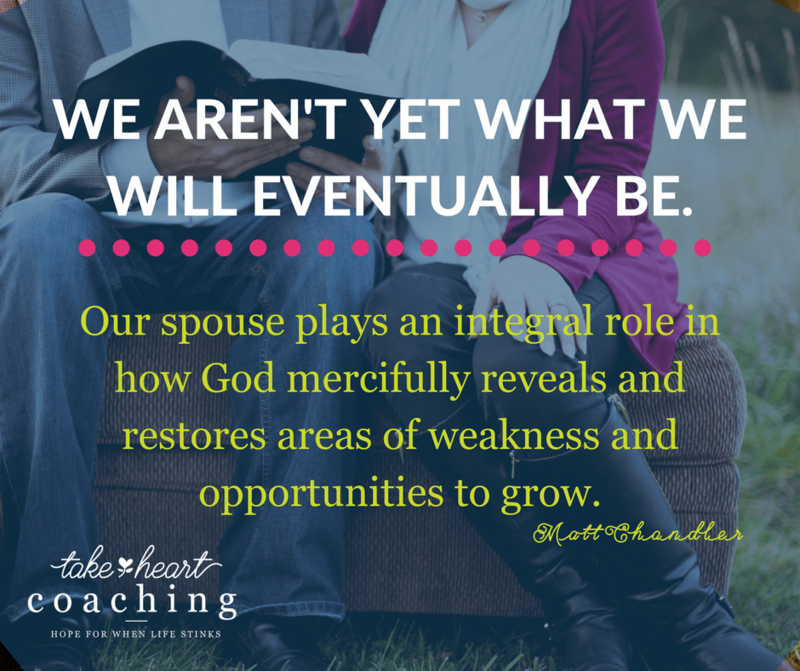 Do You See Your Spouse as Grace from God? As Valentine’s Day arrived this year I received a very sweet card from my farmer. He is usually the funny card kind guy so the card he chose for me this year really touched me. I am so thankful for him in my life. Moving beyond divorce and the disappointment, shame and hurt was not an overnight journey for me but it was so worth it. If you find yourself in a place that you never expected, divorced, take heart there is hope. God can restore what was or provide you with something new. Seek Him, repent of your sin/your part in the end of the marriage, embrace grace, forgiveness and healing. You can find the life you always thought you would have. This weekend my farmer and I attended a marriage conference together. It was such a great reminder to fix my eyes on all the things I have to be thankful for in my marriage. Looking for the good in my husband will help me to see more of it. Mingling of Souls is an annual marriage conference by Matt & Lauren Chandler. During the conference, Matt reminded us that as Christians we are not yet what we will one day be. We are a work in progress. Strange how we want our spouse to be a finished product but we see in ourselves we aren’t there yet. We often compare our very best moments or features with our spouse’s worst. Keeping our eyes focused on the truth of our journey can help us show more grace to our spouse and find more growth in ourselves. Matt also said when he was young and questioning his relationship with Lauren, a mentor once told him you will fight with someone the rest of your life; do you want it to be Lauren or not? It is funny to think of our spouse being the person we will fight with our whole life but it is true. We are both a work in progress so there will be conflict. Too often we see conflicts as something that reveals our spouse’s weakness. Instead we must see our struggles and conflict as a gift of Grace from God. Matt Chandler #TakeHeart Click To TweetInstead we must see our struggles and conflict as a gift of Grace from God. How can that be a gift? Each struggle or conflict reveals what is going on inside of us. God is revealing to us something about ourselves so we can grow. When he is late, do I give him the benefit of the doubt or do I become impatient and selfish? When he leaves his clothes on the floor instead of putting them in the hamper, am I playing a martyr or being prideful? Examining my heart will help me grow and progress in sanctification. Being angry and holding him to an unfair standard will just make us both miserable and break down our relationship. The process of becoming more like our Lord is not an easy one but it is one which we are called to engage in. Our spouse is just one of the many things the Lord uses to help us grow. In what way, will seeing your spouse as a gift of Grace from God change your relationship? The 5-year anniversary of a big ending in my life is coming up at the end of the month. My dad and I were co-owners of a Sylvan Learning Center in Hutchinson, KS. I loved what I did. Sylvan Learning Center gave me a chance to use all of my gifts and talents in exactly the way that made me excited to go to work every day. I even thought of Sylvan and my time in Hutchinson as my Promised Land (read more about that here). But it came to an end. 2 years after Ron and I were married I was still living part-time on the farm and part-time in Hutchinson (they were 90 miles apart) in order to keep the business going. Enrollment had been dwindling and things had been changing with the business for a while. But at the end of the Summer in 2011 all but 14 of my students stopped their programs. There was no way to keep the doors open. I had been sensing change was coming for a while but as usual God had to make it impossible for me to ignore Him in order for me to give up and jump on board with the change. It was time to move on. I’m so thankful God’s hand was obviously in the midst of it all. In 6 short weeks, my house was sold, all the assets of the business were gone. Everything else was all packed up and moved to the farm. It was the end of being a small business owner (for a while), the end of being my very own boss, the end of a dream I didn’t even know that I had. As I have said so many times before God is good. Just taking the time to look to Him we will see His provision. Though my certificate was expired since I never thought would teach again, I was able to walk into a part-time teaching job in October. I was blessed with a great environment and a bunch of kids I fell in love with. I was able to teach while I completed my coach training and here I am today. A small business owner again loving my job, feeling blessed and called to my work. That’s the thing about life, there are endings, they are natural, even if we don’t feel they are. I’m sure there are some of you, like me, that fight endings with all you got. Dr. Henry Cloud’s book Necessary Endings * has been a great read for me. It states that “when we fail to end things well, we are destined to repeat the mistakes that keep us from moving on.”(p12) Not ending well will often lead us to make choices that bring us to the same places again and again. Not learning our lessons or dealing with endings will set us up to make the same mistakes over and over again. Learning how to do endings well and how to process the experience allows us to move beyond patterns that can keep us stuck. Moving forward allows us to embrace what’s next. We have to learn to realize that somethings are only for that time, only in that season are we meant to stay there. 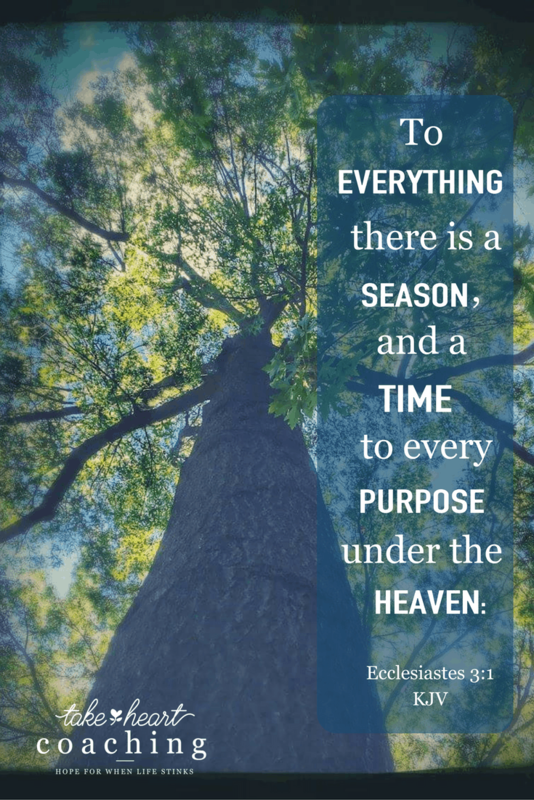 When it’s time for an end, it’s time for a new season, not the end of everything just the end of that season. So if you are facing an ending today, face it with the Lord. He can give you a new purpose, He can help you see what is next. If you need help building a new dream or even learning to like this new season, coaching can help. I would love to talk with you about coaching. Contact Me . How do you face endings? I would love to hear about an ending that has you stuck or moving into new blessing! I started my week with some sad news. One of my best friends from college, Tammy, lost her dad Sunday night. He passed away after suffering from the horrifying disease, Alzheimer’s. I don’t think it had been 2 full years since Tammy called me in tears when he was diagnosed. She knew I could relate on a deeper level since I lost my mom years ago this disease and my dad was diagnosed almost 10 years ago now. Hearing of Tammy’s loss broke my heart and hit me hard. It caused me think about my crazy life and to be thankful for my dad. It is so hard for me to think of losing my dad. As I journey with him through his diagnosis of Alzheimer’s it’s on my mind a lot that the craziness of traveling 220 miles one-way week in and week out, being away from my husband and family 3 days at a time will not be forever. Things are not easy and I am often tired but I am also thankful to be able to help take care of my dad. This week my heart was also overjoyed with the love of a very special kiddo. Tuesdays are Owen days. Owen is my 23-month old grandson and he is a blast! We have spent Tuesday’s together since he was 6 weeks old. We very rarely miss our time together. But last week was he was out of town at his other grandma’s house and I missed my Owen day. So when this Tuesday came around I just couldn’t wait to spend time with him, to just focus on him and do whatever he wanted to do. It is funny to me that one of his favorite things to do is to climb on top of a chair or the playschool slide (we have in our living room when he visits) and stand there, look around pretending like he’s not looking at me and then just fall into my arms. This week he added the wonderful sound of his sweet voice saying, “Graham” (which is what he calls me.) as he fell! It just melts my heart to have him fall into my arms, calling out my name, laughing, looking for a hug, maybe even a kiss or two, followed by some tickles too. Spending the day with my Owen was just what I needed! After my day with Owen I was praying for Tammy and her family. Letting go is so hard to do. As I prayed for them the Lord brought the image of my Owen to mind. Owen falling forward with all confidence into my arms lovingly calling out my name with a smile and a giggle and no doubts that I would be there to catch him. What a beautiful picture of trust! With that image came a challenge from the Lord, do you trust me, like he trusts you? Are you trusting me with your daddy and his health? To be honest my answer is it depends on the day. Some days it is easier to trust than others. When dad has an off day or he struggles with a caregiver I want to step in and fight for him. Tell the doctors to change medications, or find new people to help with his care. And though these might be things I need to do, what God reminded me that day was that first of all I need to jump into His arms and let him love on me and then go do what it is asked of me. I am trying to remember to do that each day. Turn to Him first in trust and then go take care of the things life requires. I still dread the thought of my dad’s passing but I am trusting that when it is time to let go of my dad I will be able to just fall face first into my Heavenly Father arms and trust him to take me through the saying goodbye part of this journey too. I don’t look forward to it, I know it won’t be easy but I also know that my Heavenly daddy will always catch me and I will be ok.
I’m so thankful for the reminder God gave me of His love for me through my Owen! How does God show his love for you? I held my children in my womb but never in my arms…. My entire life like most little girls I have always wanted to be a mommy. I never imagined I would be a mom of 2 precious children I never got to hold, cuddle, kiss or even have to discipline. After my first marriage ended I was still hopeful I would remarry and have children. No I would not be the young mom I thought I would be but I never dreamed I would not be a mom someday. Then it happened. Ron and I had been married over 2 years and I was finally pregnant. If you have struggled with infertility you know what the monthly rollercoaster ride is like. I didn’t even bother to take a test until I as a few weeks late. We were so excited! I was so sick. It was an answered to many hours of prayers for sure. Then it happened. Just the Friday before our fist doctor’s appointment, I started spotting. It wasn’t much so I was totally unprepared for the news that Monday. As the nurse did the ultrasound she told us there were twins. But the look on her face was not one of joy, rather concern. Our first baby, Isaac, looked to have stop developing at a little less than 8 weeks. The second baby, Lillian, was much bigger, at least 10 weeks old but there was no movement. The doctor came in to confirm neither of them had made it. I was in shock. My heart was shattered! How could this be happening? They were the answer to my prayers! After losing the twins life went on and I did my best to trust God in this and wait for my chance to be a mom. The longer time went by and we still were not pregnant the more my heart crumbled. I had been through tough stuff before and always found God Good but this time I struggled. How could God give me two babies and never let me hold them, play with them, or even celebrate their life? It felt cruel not good! I really struggled getting past it. 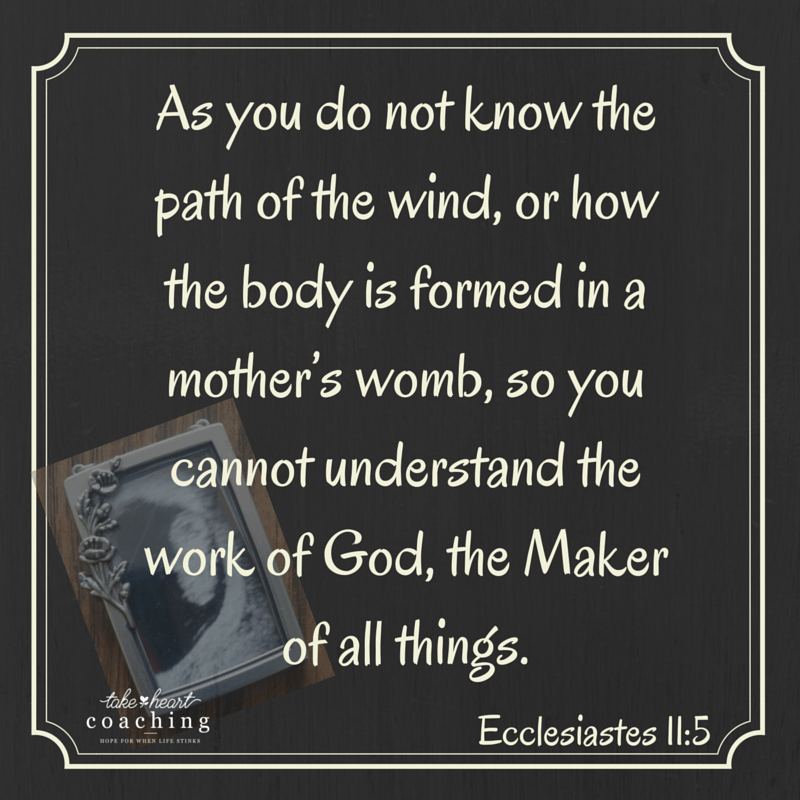 Thankfully I had a good friend who lead me to the lap of God and encouraged me to ask Him to understand. Our father always wants to talk to us and bring healing, we often just don’t know how to ask for it. That day my Lord helped me to see His eternal perspective. He had answered my prayer. I am a mom. In my mind’s eye and in my heart He showed me my two beautiful children. They were on his lap laughing and happy. He reminded me that just because they did not grow up here on earth did not mean they didn’t exist; they just went on ahead. They are waiting for me in heaven and we will spend eternity together. That day I started to call them by name, Isaac & Lillian and I embraced motherhood. Mother’s Day has always been a difficult holiday for me. Between losing my mom to an Alzheimer’s diagnosis at 16 and the struggle of infertility and now miscarriage I would rather just sleep all day to be honest. But now I have the vision of my mom, Isaac and Lillian all together in Heaven with my Lord and I praise my Great God for answered prayer. Of course I would rather have had them live here with me first but I know that God is faithful, loving and good and I trust that eternity will be long enough! Is there something that you have experienced that doesn’t make sense or goes against the character of God? Go to Him. Ask to understand, He will give you clarity around the situation if you ask with an open heart. People often stay stuck in the whys of hurts when clarity can help you move forward. Clarity gives us hope. Being able to ask God what I needed to heal gave me clarity and brought healing I wasn’t even sure was possible. When has God met you in a place that helped you find clarity?